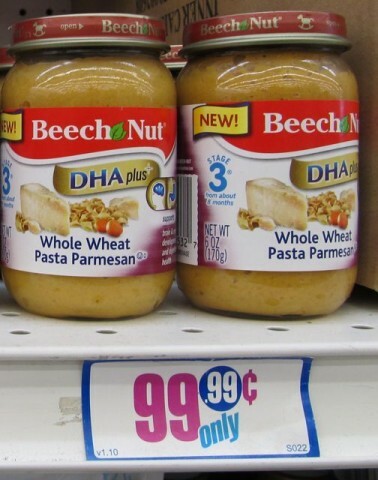 GEE, I can’t imagine how such an appealing flavor of baby food ever ended up at the 99¢ Only store. If there’s two things babies love, it’s whole wheat pasta and parmesan cheese. Ah, that the baby food people had only figured this out when you and I were infants, right? Okay, seriously: outside of, I don’t know, Italian babies I guess, what normal baby in its right mind is going to eat something like this and not puke it up on your shoulder within six minutes? I don’t know if Beech-Nut likes being #2, but I’ll tell you one thing: they keep putting crap like this on grocery shelves, and they’ll never overtake Friskies’ market share. Speaking of which, it’s time for little Emily’s din-din. Oh, and she crawls like the dickens when she hears that can opener! Posted by Ted on November 14, 2011, 9:00 AM.